Enrofloxacin is a broad-spectrum antibiotic, effective against many types of bacteria and infections. It is often used in difficult to treat infections such as bone infections, ear infections, sinus infections, pneumonias and more. 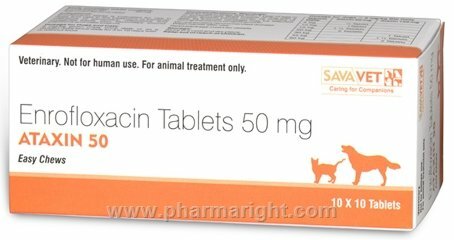 Enrofloxacin is FDA approved for use in dogs and cats. It is not FDA approved for use in horses, small pet mammals or reptiles, although it is an accepted practice. When the appropriate form or dose of this drug is not available through a veterinary pharmaceutical manufacturer, it may be compounded by a specialty pharmacy. Give this medication to your pet exactly as your veterinarian prescribes. If you miss giving your pet a dose of enrofloxacin, give the next dose as soon as you remember or, if it is close to the next scheduled dose, return to the regular schedule. Do not double dose in order to catch up. It is very important to give the entire course of enrofloxacin as directed by your veterinarian. Enrofloxacin is a very bitter medication. Different formulations of the medication are available with flavorings to help counteract the bitterness and make the medicine more acceptable. If your pet objects to one formulation or flavor, you may want to try a different formulation. It is best to give your pet enrofloxacin when its stomach is empty. If your pet vomits when the medication is given on an empty stomach, you may give it with food. Animals on enrofloxacin should have access to water at all times. Be sure to discuss any side effects with your veterinarian immediately. Side effects are more common and could become serious if your pet becomes dehydrated. The most common side effects in both cats and dogs are digestive upset, including loss of appetite, vomiting, and diarrhea. Occasionally the liver or kidneys will be affected. Rare side effects related to the central nervous system may occur. These include dizziness, weakness, seizures, and behavior changes. Cats on high doses of enrofloxacin may develop eye problems that can lead to blindness. Keep this and all drugs out of reach of children. Enrofloxacin is a prescription drug and should be used according to your veterinarian’s directions. It should only be given to the animal for which it was prescribed. Do not give this medication to a person. Enrofloxacin and the other antibiotics in this family can cause abnormal cartilage in growing animals. Therefore, most veterinarians try to avoid using these drugs in young animals. Be sure to tell your veterinarian if your pet has kidney or liver disease. Animals with decreased kidney or liver function may need extra monitoring and dose adjustments to prevent side effects or overdose. Enrofloxacin should be used with caution or avoided in animals with epilepsy or seizures. Enrofloxacin has been shown to be safe in pregnant and nursing dogs. However, because of the problems with developing cartilage, it should be avoided unless the benefits clearly outweigh the risk to the puppies. It is not known if cats are affected in the same way. There are a number of drugs that may interact with enrofloxacin. They include: nitrofurantoin, probenicid, bronchodilators such as theophylline and aminophylline, cyclosporine, flunixin, warfarin, phenytoin, methotrexate, and flunixin. Sucralfate and some antacids may interfere with the absorption of enrofloxacin. Oral iron is also thought to decrease enrofloxacin absorption. These drugs should be administered two hours apart. Different strengths or dosage forms of enrofloxacin may have different storage requirements. Read the labeling or ask your pharmacist for the storage requirements of the prescription you receive.